This is an archive service of the TRY Initiative complementary to the TRY Database and makes plant trait data, supplementary data and other data products discoverable, reusable, and citable. Content in the TRY File Archive is offered "as is." By downloading files, you agree to the terms of service of the TRY File Archive. Data download from the TRY File Archive is unrestricted - unless a restriction is posed on the individual dataset by the data owner - and requires only a free registration needed for web security reasons. Attribution: When using data via the TRY File Archive, please cite the original publication and additionally please cite the TRY File Archive data package. Reference to publication: Kattge, J., Diaz, S., Lavorel, S., Prentice, I. C., Leadley, P., Bönisch, G., Garnier, E., Westoby, M., Reich, P. B., Wright, I. J., Cornelissen, J. H. C., Violle, C., Harrison, S. P., Van Bodegom, P. M., Reichstein, M., Enquist, B. J., Soudzilovskaia, N. A., Ackerly, D. D., Anand, M., Atkin, O., Bahn, M., Baker, T. R., Baldocchi, D., Bekker, R., Blanco, C. C., Blonder, B., Bond, W. J., Bradstock, R., Bunker, D. E., Casanoves, F., Cavender-Bares, J., Chambers, J. Q., Chapin Iii, F. S., Chave, J., Coomes, D., Cornwell, W. K., Craine, J. M., Dobrin, B. H., Duarte, L., Durka, W., Elser, J., Esser, G., Estiarte, M., Fagan, W. F., Fang, J., Fernández-Méndez, F., Fidelis, A., Finegan, B., Flores, O., Ford, H., Frank, D., Freschet, G. T., Fyllas, N. M., Gallagher, R. V., Green, W. A., Gutierrez, A. G., Hickler, T., Higgins, S. I., Hodgson, J. G., Jalili, A., Jansen, S., Joly, C. A., Kerkhoff, A. J., Kirkup, D., Kitajima, K., Kleyer, M., Klotz, S., Knops, J. M. H., Kramer, K., Kühn, I., Kurokawa, H., Laughlin, D., Lee, T. D., Leishman, M., Lens, F., Lenz, T., Lewis, S. L., Lloyd, J., Llusià, J., Louault, F., Ma, S., Mahecha, M. D., Manning, P., Massad, T., Medlyn, B. E., Messier, J., Moles, A. T., Müller, S. C., Nadrowski, K., Naeem, S., Niinemets, Ü., Nöllert, S., Nueske, A., Ogaya, R., Oleksyn, J., Onipchenko, V. G., Onoda, Y., Ordonez, J., Overbeck, G., Ozinga, W. A., Patiño, S., Paula, S., Pausas, J. G., Peñuelas, J., Phillips, O. L., Pillar, V., Poorter, H., Poorter, L., Poschlod, P., Prinzing, A., Proulx, R., Rammig, A., Reinsch, S., Reu, B., Sack, L., Salgado-Negret, B., Sardans, J., Shiodera, S., Shipley, B., Siefert, A., Sosinski, E., Soussana, J.-F., Swaine, E., Swenson, N., Thompson, K., Thornton, P., Waldram, M., Weiher, E., White, M., White, S., Wright, S. J., Yguel, B., Zaehle, S., Zanne, A. E., Wirth, C. (2011) TRY - a global database of plant traits. Global Change Biology 17:2905-2935. Reference to publication: Dataset: Kattge, J. et al. (2011) TRY - a global database of plant traits. Global Change Biology 17:2905-2935. Climate: Hijmans, R.J., S.E. Cameron, J.L. Parra, P.G. Jones and A. Jarvis, 2005. Very high resolution interpolated climate surfaces for global land areas. International Journal of Climatology 25: 1965-1978. Soil: FAO/IIASA/ISRIC/ISSCAS/JRC, 2012. Harmonized World Soil Database (version 1.2). FAO, Rome, Italy and IIASA, Laxenburg, Austria. Reference to publication: Dataset: Kattge, J. et al. (2011b) TRY - a global database of plant traits. Global Change Biology 17:2905-2935. Description: Potted tree diversity experiment with 3 yrs old saplings of 5 temperate deciduous tree species (A. pseudoplatanus, C. betulus, F. sylvatica, F. excelsior and T. cordata). Each 5 trees were cultivated in an assemblage, differing in tree diversity (1,3 or 5 species) and soil water supply (moist and dry treatment). Description: To create a global leaf respiration and associated leaf traits (GlobResp)database, we combined data from recent field campaigns (Supporting Information, Table S1) with previously published data (Table S2). Data were obtained from recent publications (Atkin et al., 2013; Slot et al., 2013; Slot et al., 2014b; Weerasinghe et al., 2014) and the TRY trait database (Kattge et al., 2011; from the following TRY data 'Custodians': Peter Reich, Jens Kattge, Ülo Niinemets, Lourens Poorter and Ian Wright, noting that these Custodians have in some cases contributed data on behalf of others, most of whom are authors on the GlobResp paper). The TRY component of GlobResp includes published studies (Mooney et al., 1983; Oberbauer & Strain, 1985; Oberbauer & Strain, 1986; Chazdon & Kaufmann, 1993; Kamaluddin & Grace, 1993; Kloeppel et al., 1993; García-Núñez et al., 1995; Kloeppel & Abrams, 1995; Zotz & Winter, 1996; Grueters, 1998; Miyazawa et al., 1998; Reich et al., 1998a; Bolstad et al., 1999; Craine et al., 1999; Mitchell et al., 1999; Niinemets, 1999; Wright et al., 2001; Meir et al., 2002; Wright & Westoby, 2002; Veneklaas & Poot, 2003; Wright et al., 2004; Tjoelker et al., 2005; Machado & Reich, 2006; Poorter & Bongers, 2006; Wright et al., 2006; Meir et al., 2007; Swaine, 2007; Sendall & Reich, 2013). The database identifies individuals who were primarily responsible for collection of data (often in collaboration with other contributors), and/or who were responsible for deposition of earlier data in TRY. Description: Leaf trait data of vascular epiphytes as sampled from plants in their natural habitat. This is the original version as used in the publication. The latest version is always in the TRY database. Description: Leaf area, Leaf thickness, Specific Leaf Area, Leaf dry matter content, Leaf Nitrogen Content, Leaf Phosphorus Content, Wood Specific Gravity, Tree height and Diameter for 346 individuals in 35 tropical trees species and environmental variables: Slope, Crown Light exposition. Reference to publication: Medeiros JS, JH Burns, J Nicholson, L Rogers and O Valverde-Barrantes. 2017. Decoupled leaf and root carbon economics is a key component in the ecological diversity and evolutionary divergence of deciduous and evergreen lineages of genus Rhododendron (Ericaceae). American Journal of Botany. In Press. Description: Specific leaf area, specific root length, specific root tip abundance, root link average length and first order root diameter for 120 plants representing 27 species of Rhododendron collected from two botanical gardens. Contributors: Shipley B., Li Y. Description: The raster map of maximum plant height and aggregated data frame associated with Šímová et. al. (2019) Journal of Ecology paper entitled "The relationship of woody plant size and leaf nutrient content to large-scale productivity for forests across the Americas"
Contributors: Walther G., Kattge J., Boenisch G.
Reference to publication: Walther G., Kattge J., Boenisch G. (2019) References to primary data sources in the TRY Database. Description: The TRY Database (https://www.try-db.org, Kattge et al. 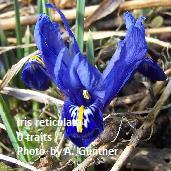 2011 GCB) contains plant trait data from several integrated databases, e.g. GLOPNET (http://bio.mq.edu.au/~iwright/glopian.htm), LEDA (https://uol.de/en/landeco/research/leda/), BIOLFLOR (https://www.ufz.de/biolflor/index.jsp) or the Seed Information Database - SID (http://data.kew.org/sid/). Each of these databases provides data from many original sources. The references to the original sources are usually provided, but often in a very condensed and not standardized format. This file contains a consolidated version of these references and the IDs to link the consolidated references to the data in the TRY database. Consider this as a working file, as for now it provides the consolidated original references up to TRY version 4.0. The references will be extended and improved in the future to cover the additional original references in later versions of the TRY database and in a more formalized format. Description: In the context of data curation to generate a new version of the TRY database, the units of numerical traits with more than 1000 records are standardized, obvious errors are corrected, and duplicates and outliers are flagged.